Critical Outcast: Hudson Horror Show X is Coming! Hudson Horror Show X is Coming! If you know me, you know how much Hudson Horror Show means to me. It is not something I can easily explain, and also something that has grown over the course of the group's nine shows over the past five years. I think what really struck it home for me was how I felt when they almost folded following the loss of their venue. Fortunately, the venue was bought and an agreement was struck allowing them to continue playing host to the movie marathon. This led directly to the success of their return show this past August, and looks to continue with the impending success of HHX (their upcoming tenth show). Now, this is probably going to come across as something of a tease as the show is already sold out. That's right, a month and a half before the show and there is not a ticket to be had. This show has proven to be their quickest sell out yet. Of course, the theater has undergone some renovations and this including replacing the word, old seats with bigger cushier ones resulting in a loss of 70 seats. This may sound like a big deal, but I suspect it only comes into play when it comes to Hudson Horror. It is a second run theater and it is unlikely they were filling them on any regular basis. Still, that just means if you want in on the fun, you need to buy your ticket as soon as they go on sale. Live and learn. If you do not have a ticket to this show, be on the look out for when show eleven is announced. If you are unfamiliar with Hudson Horror, it is a horror and exploitation movie marathon based out of Poughkeepsie, NY. 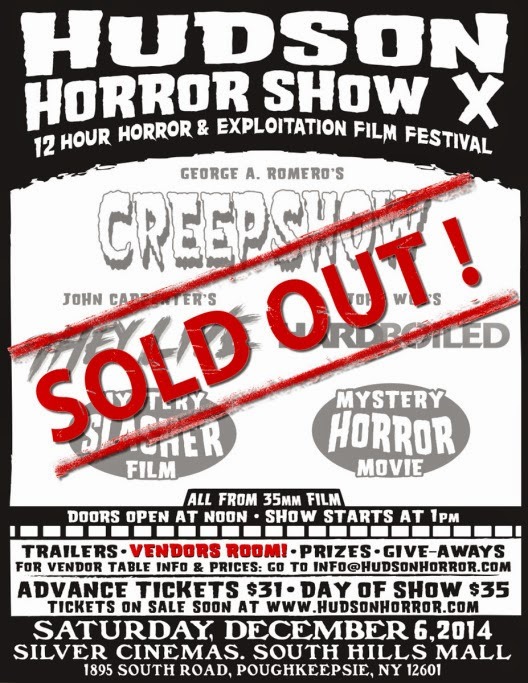 They screen movies from 35mm film with classic trailers in between the features, trivia, give aways, and plenty of vendors to buy stuff from (artists, toys, movies, all sorts of memorabilia), and, of course, the company of a theater full of fellow horror fans. It is an experience no fan should miss. There is something about watching movies in a room full of like minded individuals. It has become something of a family reunion, seeing familiar faces over and over again, and hanging with the guys who run the show, they are as friendly and approachable as you would want from a promoter. What do you think about that? Jealous? You should be. If you should have tickets, make sure you say hi to your friendly neighborhood outcast!